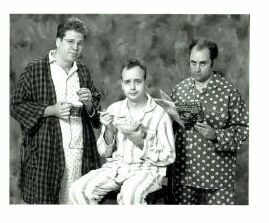 The Vestibules are a sketch comedy trio that have been all over the Canadian comedy scene since they formed in 1987. Since then, they've earned international acclaim and popularity thanks to their numerous television, radio and stage appearances in Canada, the U.S., and the U.K.
Classic Vestibule material in MP3 format. Cheap and FUNNY. Yes, a DVD of Vestibules sketches! We're selling it for ten bucks. It's a DVD! It's The Vestibules! It's good! For more info, click on the pic. Click below to see them. *Actually not really better. Exactly the same. But still... good. An assortment of videos, some from TV appearances, some self-produced. "Called twisted, bent, lazy and weird, the Vestibules bear the imprint of the trio's many popular idols, Monty Python, SCTV, Andy Kaufman and Bugs Bunny. Their only political influence is Don Knotts"
To see some pictures, just click the pic. Terence Bowman: Terence walks upright and uses tools. He has extensive experience on stage, both in theatre and in comedy, and he is currently suffering from a cold, but hopes to be over it soon. Paul Pare: Paul still believes there are little people inside the TV set. He is a former freelance writer/cartoonist whose biggest influences are Luciano Pavarotti and the letter H.
Bernard Deniger: (Pronounced AA-'Rikwe-Kzoo-Mbl'e) Bernard is a musician/comedian who has been performing comedy in Montreal for many years. He enjoys long romantic walks in the rain, and repeating the word "Blubber". Click here to send an email to the Vestibules! The Vestibules' second CD: For more info and some MP3 previews, click on the pic. 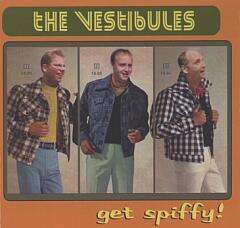 The Second Vestibules CD features FORTY really funny sketches. It's a MUST HAVE for fans of comedy, funniness, and green pants. .
CANADIAN CUSTOMERS PLEASE NOTE: ALL PAYPAL PRICES ARE IN U.S. DOLLARS. The Vestibule's First CD: For more info and some free MP3 previews, click on the pic. CANADIAN CUSTOMERS PLEASE NOTE: All PRICES ARE IN US DOLLARS.